The Indigenous guernsey design is the first in the Club’s history and has been designed by indigenous artist Anzack Newman. Newman was approached by Western Bulldogs forward Liam Jones to design the guernsey, the pair are friends of many years after attending school together at Melbourne’s Scotch College. The guernsey’s design incorporates a host of indigenous art styles, including those of the Coastal, Torres Strait Island and Desert people, and also features the names of all 18 indigenous playersthat have represented the Club in senior VFL/AFL competition. Most significantly, the artwork detailed in the guernsey design tells the story of how every individual has their own journey to playing, and being involved with, the game of Australian Rules football, and how the game has many Indigenous people with their life journey. Looking closely at the guernsey design, the dots and triangle linework are representative of the artistic style of the Desert people, while the black triangle and semi-circle linework are indicative of the artistic style of the Torres Strait Island and Coastal people. 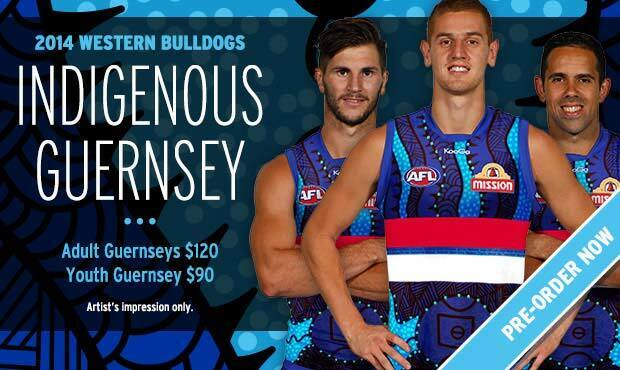 The limited edition Western Bulldogs’ Indigenous Round guernsey is available for pre-order from the Bulldogs Shop, with collection available in the weekcommencing Monday, 26 May 2014 ahead of the Fremantle match. Adult guernseys cost $120, while Youth Guernseys cost $90. The guernseys are exclusive to the Bulldogs Shop and are only available for purchase through the Club. The Western Bulldogs will wear the newly launched Indigenous Guernsey when they play the Fremantle Dockers in their home Indigenous Round match at Etihad Stadium on Sunday, 1 June 2014, commencing at 3:20pm.